Sometimes the simplest recipes are truly the best, and this extra moist pound cake is no exception. 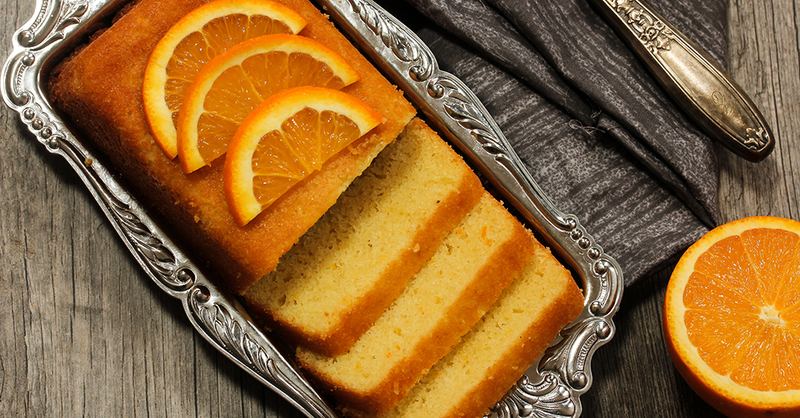 Instead of the usual lemon flavor, we switch things up with the satisfying combination of orange and almond, which is always a favorite in our home! It only takes about 10 minutes to prep, and the ingredients list is crazy simple, making this one of our go-to recipes to satisfy a sweet tooth. Whether it’s for breakfast or a snack on a lazy weekend, or a treat for a last minute get-together, we whip up this classy cake all the time…. And we bet you will too! Preheat oven to 350ºF and grease a 9x5 inch loaf pan with nonstick spray. In a large bowl, beat eggs and sugar together until sugar is dissolved and consistency is silky. Add butter and almond extract and stir well to combine. Slowly add the dry ingredients into the wet, until fully incorporated, then stir in orange juice and zest. Pour batter into loaf pan and bake for 35-40 minutes, or until toothpick inserted in center comes out clean. Cool cake to room temperature, then serve and enjoy!